A small pouch, usually made of deer skin, which contains a few items that have totemic, spiritual, or ceremonial value. These items can consist of small objects such as special rocks, animal parts, or carved amulets, in addition to a small quantity of sacred pollen, which is commonly used in a variety of prayers and rituals. Believed to provide protection and healing, a medicine bag is usually worn next to the skin, either on a string around the neck or under a waist belt. The Navajo word for medicine bag is jish, which applies to both the small bag and its contents. 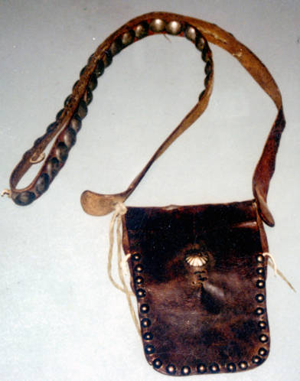 "Navajo medicine pouch," (1996_46_11). Farmington Museum, Farmington, New Mexico. All rights reserved. Use with permission only. 1912 Ceremonial Bundles of the Blackfoot Indians. Anthropological Papers. New York: The Trustees.